Until November 2012 Gwyn Griffiths was Chief Technologist and founding Head of the Marine Autonomous and Robotic Systems facility at the UK's National Oceanography Centre at Southampton. Since 1993 he has held senior engineering management positions at the Oceanography Centre and its predecessor the Institute of Oceanographic Sciences. In 2000 he was appointed to a part time Chair in Underwater Systems Engineering at the University of Southampton. With a broad background in the development of instrumentation for marine science, especially acoustic instruments, and over 20 years experience in the technology and applications of autonomous underwater vehicles Gwyn combines a wide perspective with deep knowledge of ocean technology. These qualities have led him to act as an independent reviewer for numerous projects and proposals in the UK, Europe and North America. 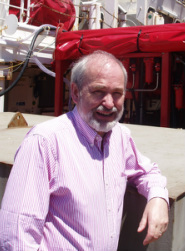 Gwyn is an active member of the Society for Underwater Technology, currently the Associate Editor for Underwater Technology, the Society's journal, a past member and Chair of the Society's Council, and the recipient of the Society's President's Award. Gwyn also contributes to the programmes of the IEEE Oceanic Engineering Society, through its Current Measurement Technology and Autonomous Underwater Vehicle committees. In September 2012 he was chair of the AUV2012 conference at Southampton. His autobiographical memoir was published in the first issue of Methods in Oceanography.